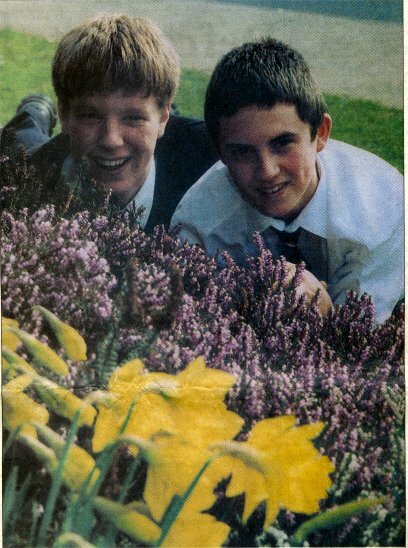 NATURE WORK: Two of the students involved in the project, Andrew Barber, 15, from Snitter, and Joseph Black,16, of Morpeth, take a closer look at the heather. Picture by JANE COLTMAN. A GROUP of King Edward VI students are taking part in a pilot project aimed at regenerating heather moorland in Northumberland's National Park. The youngsters collected seeds from mature plants, on land owned by Lilburn Estates before attemptíng to grow new heather to be replanted back in the area where the seeds originated. Fiona Knox from the National Park, who has been supervising the scheme with the KEVI students, visited the school to check on the progress of the plants and to hand out certificates to the pupils involved.